Do you ever cut a corner, then realize 70% of the way through that you’ve actually made your life 100% more difficult? I did this Monday night and learned my lesson. 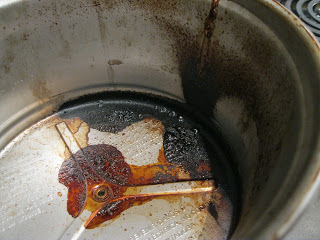 When I woke up, my genius had faded and all that was left was burnt, sticky, dried molasses all over the counter. 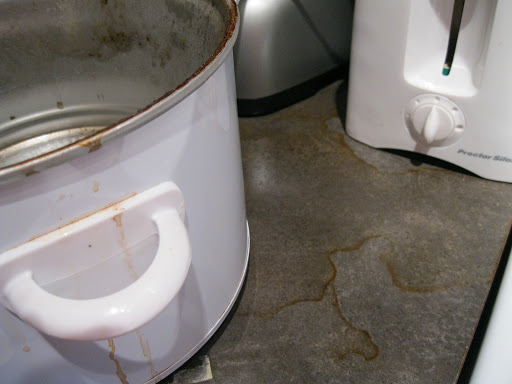 Oh, not just the counter… the baked beans liquid had bubbled up and over the edge of the pot (probably because my Crock-pot was too small for the recipe and I over filled it). This meant there was baked-beans au jus burnt to the inside of the metal burner, all over and under the items on my counter and had seeped down between the oven and the cabinet. The best part?! 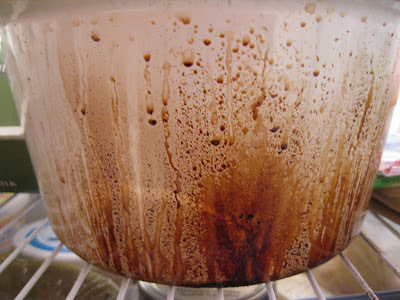 The beans weren’t even done… there was still too much liquid in the pot and they’d have to be baked. 48-hours later, too much time invested and a brown sticky mess at my fingertips, I leave you with this piece of insight: Not every hit is a home run. Not every idea is a good one and sometimes you should just follow the recipe (don’t tell anyone I said that.) It’s inevitable to find yourself in the midst of uncharted territory, especially in the kitchen. Sometimes you’ll cut your losses, sometimes you’ll stumble upon wizardry. Either way, take it with a grain of salt and a good laugh. Good luck out there Foodies.